Mark Headd: is the city’s new Chief Digital Officer a watershed figure for transparency or about to be overrun by city bureaucracy? 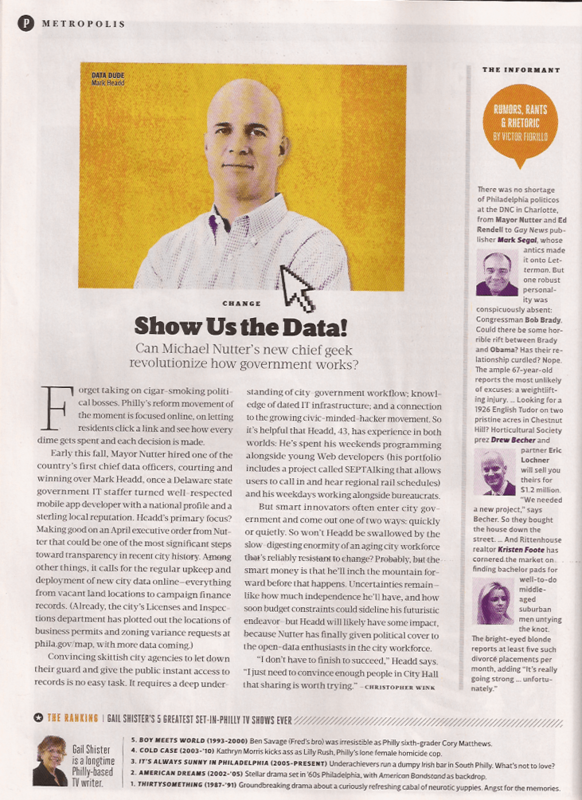 I’ve covered civic hacker Mark Headd, who was named this month the city’s first ever Chief Digital Officer, for years at Technically Philly. He’s a deeply talented technologist, well-liked by a hacker community and is coming from one of the most newly celebrated good government nonprofits in the world (Code for America). He has also worked in government before, though at a lower level. Though his new role has no established sense of power yet, he is by very nearly every perspective considered an unusually ideal city hire. As the Nutter administration moves through its newly enacted Open Data Policy, will Headd become a driving force behind its authenticity or is he due to be outmatched by the same obstacles of innovation at any big, old, staid organization? I’d love to collect some more pointed perspective and put together an item marking this turning point. Watch Headd be interviewed about open data back in 2011 during a previous role. Headd’s first days have been spent connecting the early dots on the Open Data Policy and Executive Order that Nutter unveiled in April during Philly Tech Week. In addition to the creation of Headd’s role and further governance, the policy pledged what is fast becoming the norm from forward-thinking governments: we are going to work toward making more web accessible any facts or figures about how this city operates and spends your money. Headd is taking his role after leaving San Francisco-based nonprofit Code for America, which is just finishing its second year-long fellowship round of partnering young technology evangelists with its staff. He gives a very different feel to the idea of a technocrat. Data? Think locations of business permits and zoning variances, city employee salaries and more detailed budget expenditures, all online and shareable. The shorthand for all of this is the magical, all-encompassing word “data,” the extraction of which takes a deep understanding of beleaguered city workflow, dated IT infrastructure, new standardization and a civic hacker movement that increasingly wants to help. “Mark is one of the best hires in the country for this role,” said city CIO Adel Ebeid. He has the suit and tie, which he wore both in his previous role at a nonprofit that pairs technologists with city governments and for a decade-long stint in state government. The city already has movement here: this summer, the city Licenses and Inspections Department unveiled a slew of long-overdue web resources with much more rumored to come. Cleaning up big city politics a generation ago still meant chasing cigar-smoking political bosses and big wads of cash. The stylish reform movements of today have taken on a decidedly more geek chic tenor. Mayor Nutter’s follow through on his 2007 campaign promise to clean up City Hall is being increasingly judged by how much he’s willing to share with you online. This summer, the city Licenses and Inspections Department rolled out a series of visualizations at phila.gov/map that showed things like proposed zoning variances and business permits. Cities like Chicago already share employee salaries and most expenditures online. It’s a big city dash toward letting you know how much the city spends buying staplers — though legislation from Councilman Green to go paperless entirely might make those purchases moot. The city has won national praise for its growing portfolio of social media conversations with residents. A bubbling private-sector technology and entrepreneurial scene is joining forces with the more established arts and creative communities to beat back the city’s stodgy backwater reputation. Nutter and Managing Director Rich Negrin hired its first ever Chief Innovation Officer, Adel Ebeid, a 30-year survivor of New Jersey state government with a reputation for pragmatism. The City of Philadelphia is an anchor partner of a buzzy program that puts technologists in city governments like Teach for America does for teachers and struggling schools — that program is called Code for America and, yes, Headd left tech-world rockstar status there to chase public service here. He’s being brought into the fold by the most forward-leaning Philadelphia mayoral administrations with the largest national profiles — save, perhaps, Rendell — in at least a generation. Headd himself says there is more potential — need mixing with desire — in Philly than perhaps any other city. He already has an executive order, a city’s bubbling technology community and a national open gov movement remarkably making municipal IT cool. So what if he fails? What happens when Headd is swallowed not by the nefarious ways of moustache-twisting ne’er do wells, but by the sheer slow-digesting enormity of an aging city workforce that isn’t just resistant to change, it doesn’t always seem to even know what that change would be. “When the opportunity arises for you to serve and you can do a good job, you do it,” says Headd, sounding like a soldier headed for a war zone, which is how some describe the mishmash of standards, expectations and consistency of city agency data gathering. “Philadelphia is ready for this,” Headd says. Ask just about any local civic hacker or even some of the more aware hard-nosed city IT veterans, and hiring Mark Headd . “He’s smart, competent and he can actually code,” says one former city IT staffer who follows closely. I’m always amazed by how much reporting, writing and editing goes into even the smallest of well-researched items.